Search for local business by entering a keyword below or choose from the categories. 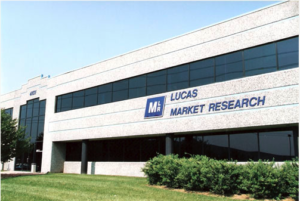 Lucas Market Research, LLC is RATED #1 in St. Louis Impulse Surveys 2014. Our comprehensive redesign includes 3 spacious/contemporary client suites with private entry/restrooms, tiered viewing rooms, closed circuit, respondent lobbies, high speed wireless internet, Focus Vision/Lucas Live streaming, digital recording, flat screens with VGA/HDMI access, test kitchen, onsite recruiting, redesigned multi-purpose room,closed circuit viewing, 50 classroom/theatre style. "Experience the New Lucas". For additional information about the products and services offered by this company, click on one of the documents below to download. Directory listing descriptions represent the opinion of the author and not Leading Edge Communications, LLC. All pictures and company information are only for guidance, and must not be seen as statements of fact. No portion of this description forms part of an offer or contract. All measurements are approximate. For more details and information about this listing, please contact the company. Please enter the words you see in the image below and enter into the text box. This is required to prevent automated submission of contact results. This facility has provided a virtual floorplan of their facility. Click on the camera or video icons below to see this facility in detail.